Melt chocolate chips in microwave until smooth. Dip 6 of the shortbread cookies in the melted chocolate, turn to coat both sides and place on wax paper to allow chocolate to harden. Once chocolate cookies have set, place a spoonful of raspberry jam in the middle of each chocolate covered cookie and top with the other 6 shortbread cookies. Have fun by dipping the cookies in shredded coconut or use white chocolate instead. Today I bring you all the pleasure of decadent alfajores without all the work. 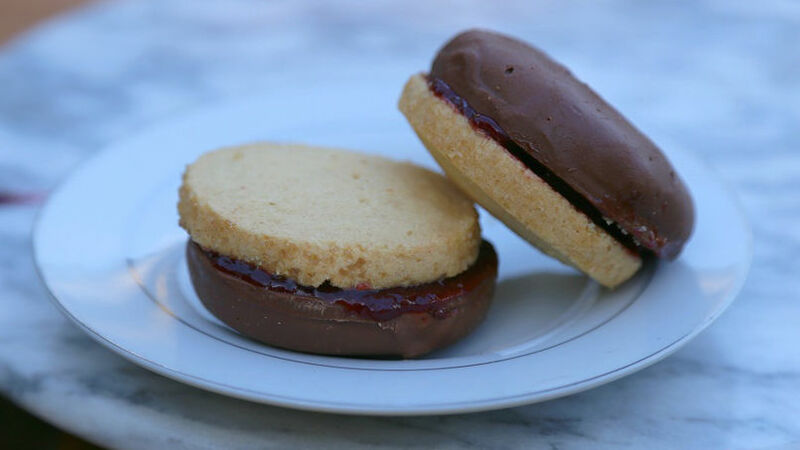 These semi-homemade alfajores filled with raspberry jam and covered in chocolate are the ultimate Valentine’s Day gift.